If you have a scenario where you have two teams in different competitions that you want to play in a friendly then you would add a scratch match. To add a new scratch match, follow the steps given below. 1. Navigate to the Calendar option in the Navigation Menu. The Calendar page will be displayed. 2. Select the New Scratch Match option from the Actions drop down list. The Scratch Match dialog will be displayed. 3. Select the type of the sport for the scratch match from the Sport drop down list. 4. Select the type of the court from the Court drop down list. 5. Select the date of the scratch match from the Date calendar. 6. Select the starting time of the scratch match from the Start Time clock. 7. Select the ending time of the scratch match from the End Time clock. 8. Enter the comments if any, in the Comments text entry box. 9. In the Home Team field, click the Select Team button to select the home team. The Team dialog will be displayed. A. Select the type of the division from the Division drop down list. B. Select the season from the Season drop down list. 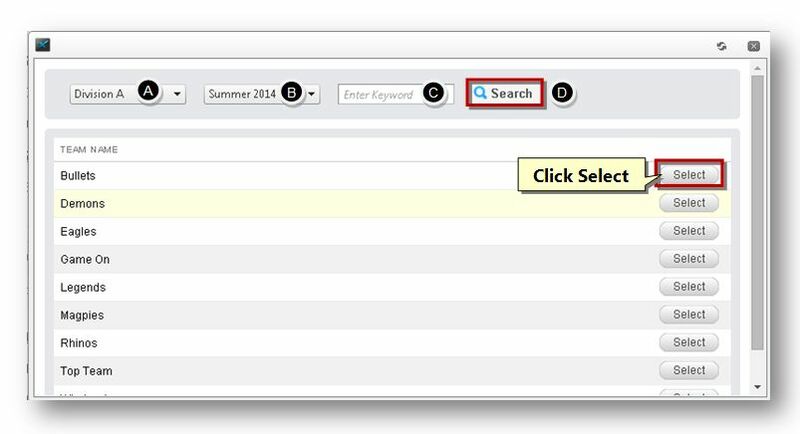 C. Enter the keyword in the Keyword text entry box. D. Click the Search ( ) button. The team list will be displayed based on the selected criteria. E. Select the team that you wish to include, by clicking the Select button in its row. The selected team will be added as home team. 10. Enter the fee of the home team in the Home Team Fee text entry box. 11. Enter the amount paid by the home team in the Home Team Amount Paid text entry box. 12. 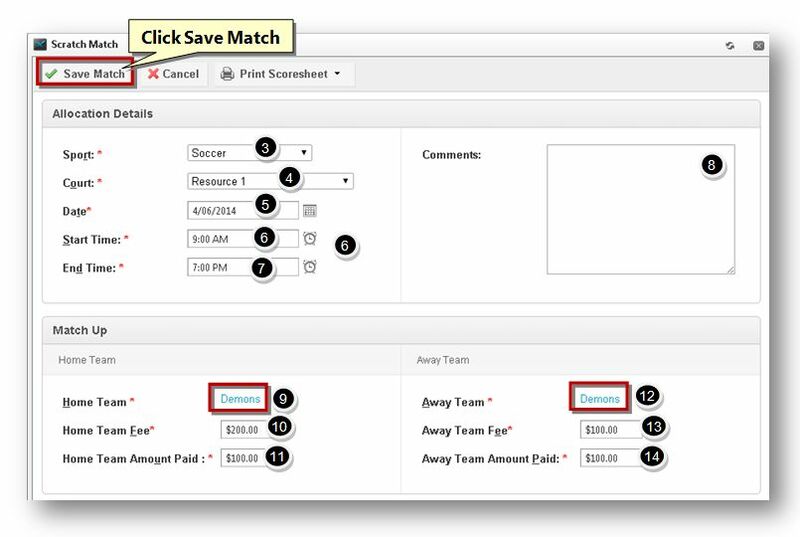 Similarly, in the Away Team field, click the Away Team button to select the away team. In the Team dialog, search and select the away team. The selected team will be added as away team. 13. Enter the fee of the away team in the Away Team Fee text entry box. 14. Enter the amount paid by the away team in the Away Team Amount Paid text entry box. 15. Click the Save Match button. The new scratch match record will be added.